Floy Grace Clark obituary. Carnes Funeral Home. 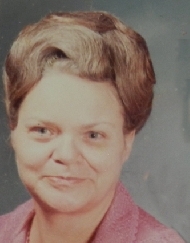 Floy Grace Clark, 86, of Texas City, passed into eternal life on Saturday evening, March 14, 2015 at Clear Lake Regional Hospital in Webster, TX. Ms. Clark was born July 30, 1928 in Fort Worth, TX. At an early age her family moved to Louisiana where she graduated from Pine Prairie High School in 1946. After graduation she attended nursing school in New Orleans and went to work for Gifford Hill as a bookkeeper in Turkey Creek, Louisiana. While working here, she met her husband Robert F (Bob) Clark at a company bar-b-que while he was visiting from Texas. They were married January 12, 1952. They moved to Galveston where Bob went to work at Todd’s Shipyard and Floy went to work at a jewelry store. She later worked a number of years for American National Insurance Company. As the mother of three sons, Floy decided to stay home and raise her children and care for her family. The family moved to the mainland where she babysat numerous children in the neighborhood. Floy was active in her church where she taught the beginners class for over 25 years, sang in the choir, and served as the missions secretary for a number of years. Floy is preceded in death by her husband Robert F Clark; youngest son Jack Clark; parents Lee and Grace Young; brothers Edward Armistead and Jack Armistead; and sister Dymple Myers. Floy is survived by sons Robert L Clark and wife Tuwanna Clark of Nederland, and Greg Clark of Texas City; sister Doris Parker and husband William of Denver, CO; grandchildren Daysherie Martinez and husband Benjamin of Nederland, Cory Clark of Galveston, and Erin Clark of Kinder, LA; and 6 great grandchildren. Other survivors include nephews Artie Armistead and wife Pat of Oakdale, LA, and Ronnie Clark and wife Evonne of Headrick, OK; and longtime friends A.S. and Sybil Britan and Mable Antoine. Funeral services are scheduled for 1 PM Thursday, March 19, 2015 at Carnes Funeral Home in Texas City. Burial will follow at Grace Memorial Park in Hitchcock. The family will receive visitors from 11AM until service time at the funeral home on Thursday. Flowers and memorials may be sent to the funeral home.